160 acre farm in Section 36 of Paton Township, Greene County, Iowa AND a 80 acre farm located in Section 2 of Junction Township, Greene County, Iowa to be sold at public auction. Tuesday, November 18, ’14 at: 10:00 A.M.
Sale to be conducted in the Paton Community Center, Paton, IA. 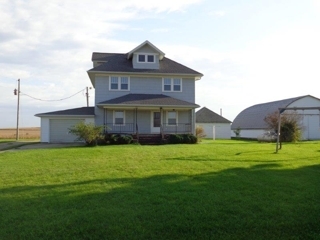 Farm #1 is located at 2481 150th Street, Paton, IA. From Paton, IA., 3 miles east on E18, 2 miles south on P46, 1/2 mile east on 150th Street OR From Dana, IA., 3 miles east on E26, 2 miles north on P46, 1/2 mile east on 150th Street. Farm #2is located from Farm #1, 1/2 mile west on 150th Street, 1 1/4 miles south on P46 OR From Dana, IA., 3 miles east on E26, 1/2 mile north on P46. FARM # 1: The NE 1/4 of Section 36, Township 85 North, Range 29 West of the 5th P.M. (Paton Twp. ), Greene County, Iowa. 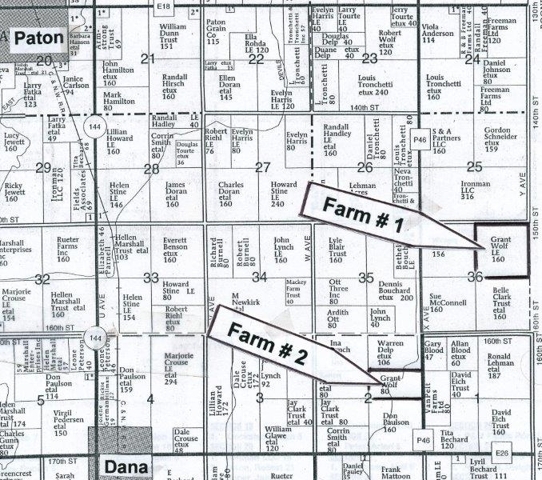 FARM # 2: The S1/2 of the NE1/4 of Section 2, Township 84 North, Range 29 West of the 5th P.M. (Junction Twp. ), Greene County, Iowa. FARM #1 is an improved 160 acre, more or less, farm and will be offered as two 80 acre parcels, indentified as Parcel 1: An improved 80 acre parcel (The East half of the farm which includes the building site) and Parcel 2: A bare 80 acre parcel (West half of the farm). High bidder will have choice of Parcel #1, Parcel #2 or the both parcels. In the event the high bidder selects one parcel, the remaining parcel will then be sold. Parcel 1 (E1/2 of farm) includes a building site which features a 2 story 4 bedroom home with an attached garage; an older detached garage; a 10,000 bu. grain bin w/dryer; a 40’x60′ Quonset type machine shed w/concrete floor and an framed open front cattle shed. Parcel 2 (W1/2 of farm) is all tillable, except for the normal roadway easement. This farm is served by Drainage District No. 173-224 with a district tile and a private tile running through this farm. Surety Digital Soil Rating Service indicates an average CSR(2) of 78.1 & CSR of 74.6 (Parcel A: CSR(2) of 81.7 & CSR of 77.9 & Parcel B: CSR(2) of 74.9 & CSR of 71.7). The Greene County FSA Office indicates: Cropland acres: 157.73; Corn base of 102.7 with Direct & CC yield index of 114; Soybean base of 50.8 with Direct & CC yield of 37. FARM #2 is a bare 80 acre, more or less, parcel will be offered as an 80 acre unit. Surety Digital Soil Rating Service indicates CSR(2) of 76.9 & CSR of 71.5. 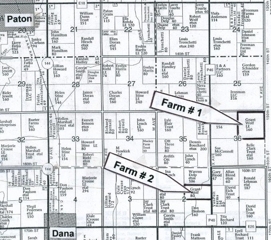 This farm is also served by Drainage District No.173-224. The Greene County FSA office indicates: Cropland acres of 71.11; Corn base of 35.2 with Direct yield of 114 & CC yield of 131; Soybean base of 30.7 with Direct yield of 38 & CC yield of 46. 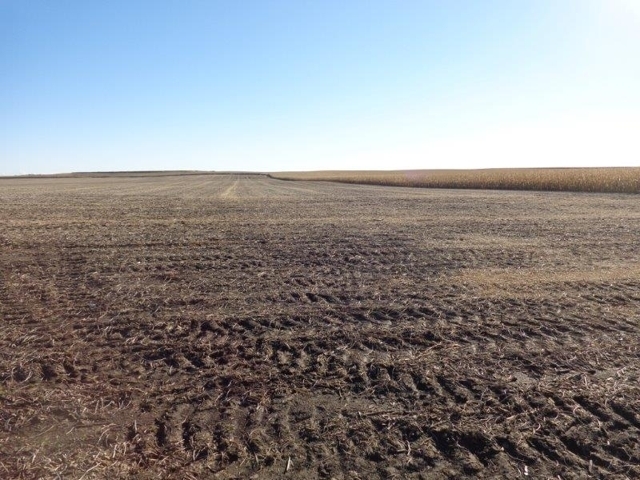 Of the 71.11 cropland acres, 5.2 acres are enrolled in a CRP buffer strips. 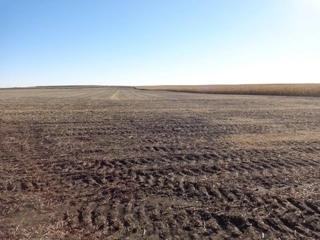 This CRP contact is computed on the basis of $ 298.80/acre for a total annual payment of $ 1,554. This contract expires on September 20, 2023. Purchaser(s) will be expected to pay 10% of the purchase price on day of sale and sign a standard real estate contract agreeing to pay the balance on or before March 2, 2015. Possession will be given upon closing. 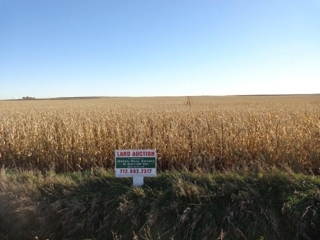 The 2014 farm leases have been properly terminated and the Buyer(s) will receive full possession at closing. There are no Buyer contingencies of any kind. All potential bidders are expected to have financial arrangements made prior to bidding. Auctioneers represent the Sellers in this real estate auction and resulting transactions. Any announcements made day of sale will supersede any advertising. GREEN REAL ESATE & AUCTION CO.